The Deputy Minister for Roads and Highways, Anthony Karbo has been invited by the Criminal Investigations Department (CID) of the Ghana Police Service for questioning. 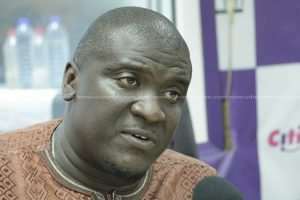 Karbo’s invitation is in connection with the CID’s ongoing investigations into allegations of fraud against Kwesi Nyantakyi by President Akufo-Addo. Citi News sources say Mr Karbo’s name came up in an undercover video by journalist Anas Aremeyaw Anas which showed Kwesi Nyantakyi using President Akufo-Addo’s name to solicit a bribe from supposed potential investors. The editor-in-chief of the New Crusading Guide newspaper, Kweku Baako, who is a mentor to Anas Aremeyaw Anas confirmed on Metro TV’s Good Morning Ghana that Anthony Karbo, who is also the Member of Parliament for Lawra constituency was mentioned in the film. He said the investigative team had scheduled to interview Mr. Karbo on Wednesday to comment on the aspect of the yet-to-be-released video where he was mentioned. “Karbo is mentioned, Karbo is the one scheduled to be interviewed on Wednesday, I don’t see why you are doubting that I’m saying this on a public record. Karbo is mentioned and he is aware that he’s been mentioned and he knew that Wednesday, we were to meet for the interview, so he would have watched. “If you are not being interviewed, you can’t watch the portion that concerns you, so he knew. He was scheduled to be interviewed on Wednesday, meaning, he would have had the opportunity to watch portions of where he was mentioned so that he can react, and that is part of the investigations, so, the investigation is incomplete and that’s what I say,” Kweku Baako said.